At Carter Recruiting & Associates, helping others is not just a part of our Arkansas recruiting agency. It's who we are in and out of the office. In the nearly two decades we've been in business, we have made it our mission to get involved in the Arkansas community by supporting civic groups, schools, and various organizations. These are a few of the causes and programs that we have been blessed to support. 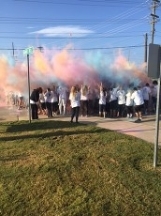 What an honor to be part of the First Annual Color Run for Kids, hosted by Lambda Chi Alpha Fraternity helping to rais more than $10,000 for Arkansas Children's Hospital. Carter Recruiting and Associates' president, Cherie Richardson, was presented with the "Cherie Richardson Biggest Heart Award" an award that will continue to be given annually at the event! Carter Recruiting's President, Cherie Richardson, along with her sister and two daughters was thrilled to sponsor for three consecutive years, the Pi Beta Phi 5K at the University of Arkansas, benefiting Children's Literacy. PROUD TO SUPPORT THE UNIVERSITY OF ARKANSAS RAZORBACK FOOTBALL TEAM! Carter Recruiting and Associates was proud to support the Big Brothers Big Sister's fifth annual "Big Night Out", a fun summer party that paired successful professionals to create a special event or outing and auction it off to the hightest bidder. Carter Recruiting paired with Richardson Plumbing to promote a Dinner Pool Party - the highest bidder paid $850.00 for the exclusive package, the highest bid of the night. The event brought in $22,000 to the organization, which has been providing one-on-one mentoring to children for more than 40 years. LAKEWOOD ELEMENTARY HELPING THE HOMELESS - We are happy to continue our support of the students at Lakewood Elementary School! The students in Cathy Thomas' fifth grade classroom have brainstormed, researched and created ways in which they can make a difference in the homeless community by designing T-shirts that can be purchased to help their cause, designing raffle tickets to sell for an iPad mini and also creating a website that helps raise awareness to their homeless project. Visit www.lwehomelessproject.weebly.com to learn more! RAWLINGS GOLF TOURNAMENT - Carter Recruiting and Associates was honored to sponsor the Rawlings 2013 Golf Tournament to support the team's upcoming World Series game for twelve year olds. When Mrs Thomas' fifth grade class decided to take action to to help the people of Sudan and raise funds for the project they knew they could count on Carter Recruiting and Associates to reach their goal. Carter Recruiting and Associates was happy to help Mrs. Thomas' class once again. The class raised $677 from designing and selling buttons which will help build a well, providing much needed clean drinking water to the region. 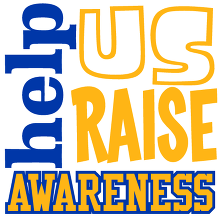 "When I saw the enthusiasm and creativity of these kids I just knew we needed to be a part of helping them make these buttons as well as making a monetary donation to this important cause," said Carter Recruiting's President, Cherie Richardson. Carter Recruiting and Associates have been a very dedicatedsponsor the last 11 years to several local USSSA baseball teams. Carter Recruiting and Associates is doing its part to make sure kids in a fifth-grade class at Lakewood Elementary build the kind of character it takes to be leaders in their school. The class has adopted a motto of Be Brave, Be Accepting, Be Yourself, Be Involved, Be Kind, and Be Amazing. Throughout the coming year students will work hard to earn an achievement bracelet for each of the 6 criteria. Carter Recruiting is happy to supply the students with these very special bracelets to encourage them to continue to build strong character and set an exemplary model for their peers.